Greek colonists and their Roman successors left the first imprints on Albania and the ruins of two of their cities, Apollonia and Butrint, remain to entice visitors. Albania abandoned Communism in 1992. In the last years the country has made enormous strides in democracy and development. It became a great destination for tourists. The country’s Mediterranean coastline and mostly unspoiled mountainous interior offer great tourist potential. 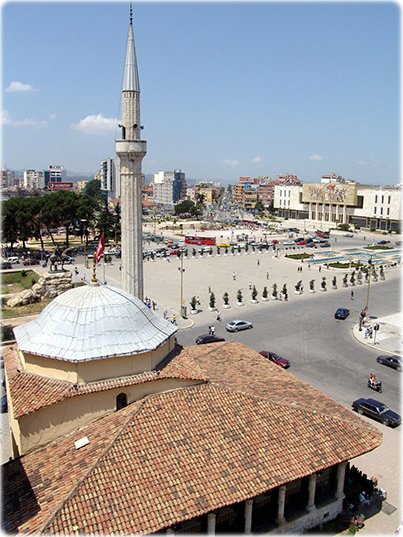 The capital, Tirana, is an interesting starting point. Other large cities include Elbasan, in central eastern Albania, Shkodër, in the northwest, and the port of Vlorë in the south central region. Albania is a mountainous country in which about 70% of the land lies above 300 m.
Albania’s distinctive culture also borrows from the Greeks, Romans, Byzantines, Turks, Slavs, and Italians, who conquered the Balkans. Skanderbeg Square in the center of Tirana as viewed from the city's clock tower.